No assigned parking. We offer spaces to rent for Trailers/Boats/RV's and Oversized Vehicles on a first come, first served basis. 1 Glistening Pool & A Large Playful Splash Park! Both these amenities come complete with luxury lounge chairs and umbrellas. Forest Isle is Resort Living at it's best! Convenient when you want a snack or drink and always open! Front Gate Give-Away: Complimentary Treats Each Month! Gated Community w/ 24hr Guard and Courtesy Patrol. Exclusive Forest Isle ID Cards issued for access/entry and use of property amenities. Lucrative Resident Referral Program $$$ Earn free rent for referring friends, family and co-workers to live in this resort - like community. Room To Park for Extra Vehicles! Our designated parking area for large recreational vehicles, boats and trailers - easily accessible! 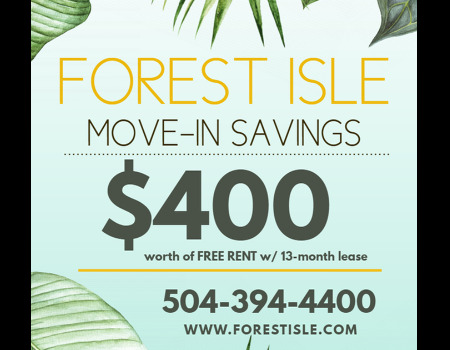 Forest Isle Apartments is a pet friendly community offering 2 DOG PARKS! We allow two pets per apartment. No weight limits, however certain breeds are restricted such as Dobermans, Chows, Rottweilers, Akitas and Pit BullTypes/Mixes. Further restrictions may apply to any breed of dog that exhibits particularly powerful jaws, aggressiveness and/or the ability to withstand infliction of pain to a degree that makes such a breed particularly dangerous. Shot Records are required. $300 Refundable Pet Deposit (per pet) for existing flooring. $600 per pet for brand new carpeted units.